Chrome and metallic vehicle wraps offer an additional level of elegance and high-end beauty to your automobile. 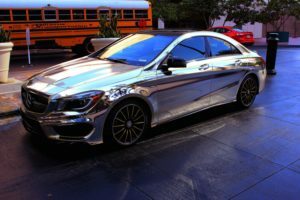 The chrome wraps on the market today have become unbelievably realistic and are often mistaken for actual gold or silver plating (depending on your color choice). Chrome and metallic vehicle wraps stand above paint in that the color remains as vibrant as it did on day one, even years later. Wrapping is an affordable alternative to an entire paint job, and can extend beyond the painted surfaces of a vehicle, adding even more depth and customization! Why Choose Chrome & Metallic Wraps? Do you like to stand out? Do you like to be different? Would you like a complete metallic custom design? We can do that too! Let our design team show you the possibilities. We can create your one-of-a-kind custom design, print it in high definition and make metallic magic happen! You will never look at your car the same way again! So now let us talk about the game changer of all wraps. Chrome! If you want to be the life of the party, then this should do the trick…you get to go to the front of the line! You can choose from Silver, Gold, Blue, Red or Black Chrome that will make you feel like a rock star on main street. Updated on September 19, 2018 at 8:18 pm by Metroplex Wraps.